In a previous post, we learned how to use Lumeer’s smart document to create an invitation to a townhall meeting. 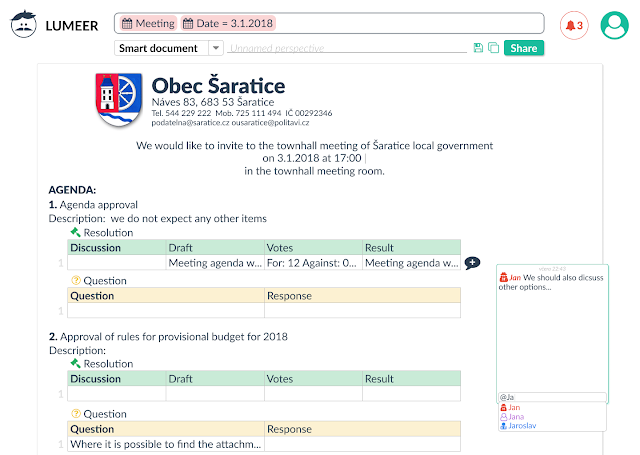 Now we will add some useful features to it - resolutions and discussion management, so the invitation becomes meeting minutes document. We start with the invitation, which is a smart document based on the Meeting and Agenda collections. Here, we add a new relation which will represent meeting resolutions. Tables from new unnamed collection appear below every activity from the meeting agenda. We set a collection name (Resolution), colour and icon and add columns. It is sufficient to do that just once and all three tables are updated. Let’s add descriptions to agenda activities. It’s simple - just right-click on an activity text, which is then highlighted in green, because it’s not just normal document text, it’s a piece of data from the Agenda collection. 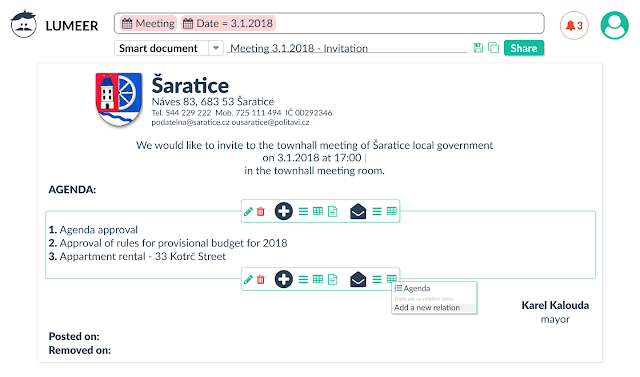 Descriptions are also added as a new column into the Meeting collection. This way we not only style new data to look the way we want, we also create them in the collection at the same time. In the same way as we created the Resolution collection, we also create the Discussion collection which enables members of the municipality to ask questions before the meeting, so the mayor can answer and clarify everything that is not clear even before the meeting. However, we don’t want to allow every member to edit all data in the document, just to add the questions, thus we go to the Question collection settings and set read and add access rights for the user group Local gov containing all the members. There may also be not only questions but also other comments from municipality members regarding the content of the document. That’s not a problem in Lumeer - they can comment on every row of the document by clicking on an icon next to the row. A member can even directly mention other members in a comment if they want further response from them. 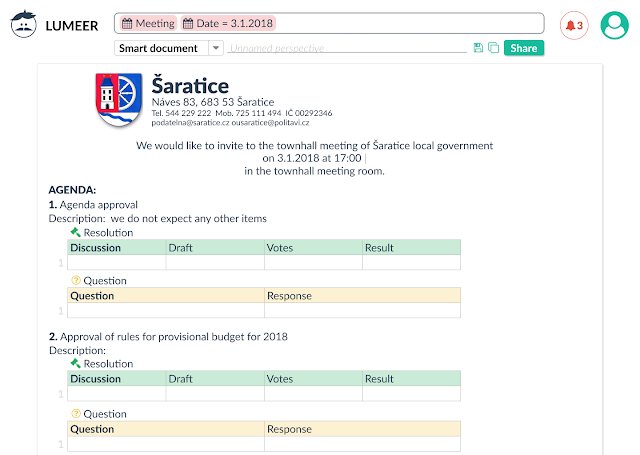 If we get back to the page with the collection listing, we see our new collections Resolution and Question already there - they aren’t different from Meeting and Agenda in any way, although they were created while editing smart document with the meeting invitation and minutes. In summary, we have demonstrated how Lumeer enables users to create, edit, format and collaborate on their data via its intuitive user interface, which results in quick solutions of problems from various fields, municipality management amongst them. In a next post, we will show how to effectively search and export your data.